My last post dealt with transformations in the grocery shopper’s service journey in the United States since the late 19th century, after creation of the shopping bag. It noted that, before the shopping cart was introduced into grocery stores, the shopper’s journey started with paper grocery bags and noted the transformation required to get shoppers to use shopping carts. In recent years, local and state governments, grocers and other retailers, as well as many shoppers increasingly understand the environmental impact of using so many disposable bags, whether paper or plastic. Not to mention the direct costs to the grocer in providing the disposable bags. Let’s start off with an anecdote. Schnucks is a grocery chain in the St. Louis area that I sometimes frequent. The particular store I shop in seems to stock the best Bibb lettuce in my area and that is the main reason I go there. Earlier this year, as I entered that store, I experienced the simplest solution you could imagine to a recurrent problem many retail shoppers face. Someone in this store took the time to mount a reusable Schnucks bag onto a matte board and attach it to the Enter doorway. Even though I was almost in the store when I saw it, the mere sign with no call to action gave me the motivation to turn around and go to my car trunk to retrieve some reusable bags. A Facebook group even exists for I always forget my green bags. 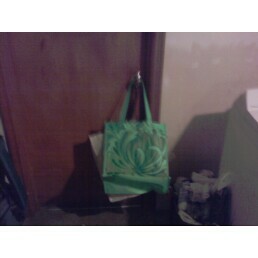 For those of you who own reusable shopping bags I’d wager you know the experience. In fact, one of the reasons my household has so many of these reusable bags is that my wife often forgets also, but she is not reluctant to just buy another one or two bags instead of using paper or plastic. Don’t ask! In addition to an inexplicable sense of inappropriateness, which my wife says she shares, in bringing a Dierbergs bag into Schnucks, and vice versa, or banish the thought, to bring a Schnucks or Dierbergs reusable bag into Whole Foods or Trader Joes, the main culprit for my failure to remember is usually just getting in a hurry. Any way you look at the numbers, many more people own reusable bags than use them consistently. Someone at the Schnucks store who posted the sign is obviously listening to those customers who end up at the checkout and express dismay over forgetting their reusable bags. None of the other five or six Schnucks stores I occasionally shop have posted such signs. Schnucks lacks a strategic communications strategy for addressing the green customer need in question, i.e. the desire to remember reusable bags. Schnucks isn’t alone. Dierbergs doesn’t provide signs to support reusable bag shopping at the start of the customer journey. Neither does Whole Foods or Trader Joes, at least in St. Louis. Nevertheless, the Schnucks store discussed in this post developed a workaround for the overall failure of the company to engage the shopping journey needs of its customers. It serves as a paradigmatic example of service design brought to the wayfinding challenges of grocery shoppers who are interested and motivated to minimize their environmental impact. A customer that voluntarily expresses dismay over leaving their reusable shopping bags in their automobile trunk, or at home, is also revealing a desire, an emotional response to their own failure to remember a personal commitment to a larger purpose, i.e. they want to act in an environmentally responsible way. It is a purposive desire. I suggest that such purposive desires are relevant to service design and wayfinding, and the sections below outline how. Grocery shopping is one of those chores that we all have to do from time to time. I’m introducing the topic of grocery shopping as a service journey not because the concept is new. In-store ethnographic studies, and shop-alongs, implicitly recognize the concept. Few people who analyze what grocers do, and how people who shop in their stores get the job of buying groceries done, would be surprised that it is a journey. And, of course, the journey starts in the shopper’s home, which Tesco’s Fresh and Easy discovered the hard way when they expanded from the United Kingdom to the United States. What I want to do here is provide a brief, high level history of the U.S. grocery shopper’s journey, and key transformations of that journey, to establish the context for my next post. Other than time, money, and typically transportation, two pieces of technology are critical to the journey we take as we shop, especially for groceries. We must collect items around the store and move them to the checkout counter. Once our grocery items are checked out and we pay for them, we must move those groceries from the store to our source of transportation. For many of us that transportation consists of an automobile, or other vehicle; for others it may be public transport. A partial solution to the challenge of collecting items around the store came with the invention of flat-bottomed paper bags by Margaret Knight in 1870. However, it really wasn’t until Walter H. Deubner, a grocery store owner in St. Paul, Minnesota, created a shopping bag in 1915 (a paper bag with a cord running through it for strength) that a workable solution to the challenge of collecting and moving items from shelves to the checkout counter came along. The Deubner Shopping Bag carried up to seventy pounds of groceries. In other words, at least initially, the grocery bag was supplied before customers began to shop. The invention of the shopping cart by Sylvan Goldman in 1936 provided the basis for changing the shopping journey. Consider the problems he faced in persuading shoppers to change their shopping journey. Goldman’s concept was simple: make shopping easier for the customer and they’ll visit the store more frequently, and buy more. Unfortunately, the customers didn’t want to use the carts. Young men thought they would appear weak; young women felt the carts were unfashionable; and older people didn’t want to appear helpless. So, Goldman hired models of all ages and both sexes to push the things around the store, pretending they were shopping. That, and an attractive store greeter encouraging use of the carts, did the trick. Paid female model pushing shopping cart. By 1940 shopping carts had found so firm a place in American life as to grace the cover of the Saturday Evening Post. Supermarkets were redesigned to accommodate them. Checkout counter design and the layout of aisles changed. As a result, shopping bags were relocated in the shopper’s journey, with the exception of small bags for produce and other perishables. The invention of plastic bags later on added another alternative for bagging, in the produce section as well as the checkout counter, and it was a cheaper direct cost than paper. Today, the result of these basic technologies for supporting grocery shoppers makes the experience much easier, no doubt less stressful on the back and shoulders than carrying heavy bags around the store while shopping. My next post focuses on the current transformational challenge facing the grocery shopper’s service journey through the diffusion of reusable bags. As this post’s subject indicates, my interest here is to explain how social network analysis, applied to the ecosystems of organizations, helps apply social business design in a manner that avoids the fallacy of open/closed business cultures. We can’t know how open or closed a business culture is until we research, analyze, and understand both its formal and informal networks. To paraphrase Valdis Krebs, a social network analyst, more connections are not necessarily better…Valdis Krebs, and other social network analysts engaged in ONA (Rob Cross and Steve Borgatti, for example) contend that the most efficient and effective adaptation to emergent challenges lies in “the pattern of direct and indirect links” in the ecosystem. You can read a straightforward overview of ONA by Valdis. This post continues David’s line of thinking by considering a combination of two of his strategic questions in light of the open/closed culture fallacy. I also take a stab at noting how to answer his last question. Think about a closed business culture. Try to visualize what it looks like. What do you see? Does it look something like a pyramid? Now, think about an open business culture. Try to visualize it. What image comes to mind? Does it look something like a spider web turned on its side? These two imaginings pose similar relationships between their parts. A three dimensional pyramid flattened out is about the same shape as a spider web. It is a matter of perspective as to whether one is more open or closed than the other. When connections are made across, rather than only between, the existing nodes in a network we can start to visualize informal relationships in a way that adds value to discussions of culture. It sounds simple, at least initially. So, how do these observations relate to culture and social business design? The presentations from Transform are now available online. Take some time and listen to these videos if you are in the least interested in how to transform health care. Health care is increasingly gaining attention as an area in which innovation involves informal learning, and many of the other topics that go along with using Web 2.0 to engage people. The current debates at the national level about changing health insurance carry with them an underlying focus on innovation in the design and delivery of healthcare services, an area referred to for several years as Health Care 2.0. And the Mayo Clinic is always at the top of the list when innovation is discussed in healthcare. So, it isn’t a surprise that the Mayo Clinic is sponsoring a symposium in September focusing specifically on innovating health care experience and delivery. The symposium includes a number of segments with intriguing topics. However, the two I find most interesting are the Redefining Roles and the Content, Community, Commerce, Care, & Choices segments. It looks like a promising experience for those fortunate enough to attend. This segment will introduce the emerging roles of disruptive technology and business model innovations in making products and services in health care affordable and accessible. It will touch upon the evolution of health care delivery systems — particularly hospitals — from geographically-centered and costly entities to decentralized and more focused operations. Participants will be introduced to emerging business models in health care, including facilitated networks — online communities of people who help to teach one another about how to live with their diseases. This segment will also explore the notion that health care can be designed to minimize the degree to which it disturbs peoples’ lives. Communities of people are sharing health care-related content online. This has come to be called “Health 2.0.” Individuals and organizations have built business ventures around sharing content. But what does it take for these models to evolve into reliable facilitators of wellness? How can these communities link with existing bricks-and-mortar care delivery systems in ways that help people in their journey to wellness? What are “microchoices” and how might they be more powerful than all of health care? My interest in using communities to enhance the service experience goes back several years. I had not considered their application to health care services until recently when an associate pointed me to several hospitals using social media to connect with patients. It looks like a promising area for innovation and highlights the relevance of informal learning to health care services. Thanks to Tim Brown at Design Thinking for the pointer to the Mayo symposium.